Rewind takes place across three locations: Rewind Scotland in Scone Palace, Perth (19-21 July);Rewind North in Capesthorne Hall, Macclesfield (2-4 August); and Rewind South in Temple Island Meadows, Henley-on-Thames (16-18 August). 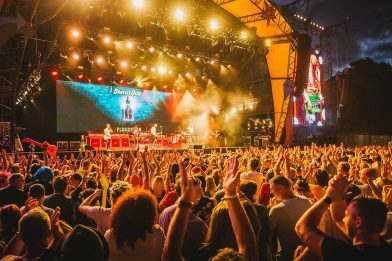 The festival drew their biggest crowds last year with their most extensive entertainment line up yet which featured comedy from Milton Jones and Daisy Earl, special DJ sets from Spandau Ballet’s Martin Kemp, and even a series of boat parties on the Thames. This year, organisers promise to take Rewind to new heights with their most musically diverse line-up to date and a jam-packed programme of comedy, cinema and interactive fun to thrill their audiences up and down the country. Foreigner makes their Rewind debut by headlining Rewind Scotland on Saturday 20 July. Headed up by Mick Jones and lead singer Kelly Hansen, Foreigner is one of the most popular rock acts in the world with over 80 million records sold, 10 multi-platinum albums and 16 Top 30 hits to their name. The band’s string of hits include the enduring anthems: ‘I Want To Know What Love Is’, ‘Cold As Ice’, and ‘Hot Blooded’. Joining the band on the day are Lulu, Paul Young, Eddi Reader, Joyce Sims, Black Box, The Dire Straits Experience, The Undertones, The Primitives and Hipsway. Bryan Ferry is set to headline on Sunday 21 July, fresh from being inducted into the 2019 Rock & Roll Hall of Fame as part of Roxy Music. Unquestionably one of Britain’s most influential figures in rock, Bryan – as a solo artist combined with Roxy Music – has sold over 30 million albums worldwide, achieving three #1 albums (Avalon, Flesh and Blood, and Stranded) and a string of Top 10 singles. Bryan Ferry said: “Really looking forward to returning to Scotland again this year to perform at Rewind Festival”. Joining Bryan for the final day of Rewind Scotland are Lisa Stansfield, Belinda Carlisle, Hazel O’Connor, Midge Ure, Bjorn Again, The Skids and Big Country. Martin Kemp will be kicking off the weekend feeling on Friday night with a special DJ set on the Forever Stage. Disco and R&B queen Gloria Gaynor will be headlining Rewind for the first time on Saturday 3 August. She will be raising the roof with her performance of the timeless dancefloor anthem ‘I Will Survive’, ‘Never Can Say Goodbye’ and more. Joining Gloria on this vibrant day of live music is Bananarama, Tiffany, Heather Small, Hazel O’Connor, UB40 (feat. Ali Campbell and Astro), The Dire Straits Experience, Neville Staple, The Undertones and The Primitives. Thin Lizzy are back in town! The legendary rockers will be headlining Rewind North on Sunday 4 August to mark their 50th anniversary year. The band have released 12 studio albums throughout the 70s and early 80s, spawning the signature songs ‘The Boys Are Back in Town’, ‘Whiskey In The Jar’, ‘Dancing In The Moonlight (It Caught Me In Its Spotlight)’ and ‘Jailbreak’. Guitarist Scott Gorham said: “It’s an honour to play Rewind – with so many classic artists on the bill it’s going to be a day to remember”. Joining Thin Lizzy are Level 42, Heaven 17, Joyce Sims, Cutting Crew, Black Box, Bjorn Again, The Selecter and From The Jam. The Forever Stage is quickly becoming an essential party centre for Rewinders with a festival schedule full of live music, family fun and stand-up sets by leading comedians. On Friday night, Martin Kemp will be playing a special DJ set jammed pack with some 80s gold. Four Tops – one of the defining acts of the Motown era – is headlining Rewind South on Saturday 17 August. Led by original member Duke Fakir, the quartet is set to deliver a spirited performance of their classics such as ‘Reach Out (I’ll Be There)’ and ‘I Can’t Help Myself (Sugar Pie, Honey Bunch)’. Throughout their rich career, the Four Tops have been honoured with a Grammy Lifetime Achievement Award, had two songs in the Grammy Hall of Fame, and been named in the Rolling Stone’s 100 Greatest Artists of All Time. Joining Four Tops at Rewind South are Lulu, Heaven 17, Heather Small, Tiffany, Kim Appleby, UB40 (featuring Ali Campbell and Astro), The Dire Straits Experience and The Undertones. Ali Campbell and Astro of UB40 said: “There is nothing quite like performing at Rewind! The audiences are some of the happiest you will find anywhere and it’s very special to be a part of that. This is looking like the festival’s most diverse line-up yet. It’s going to be great seeing all these artists from different genres and decades come together in one place. Come and see us perform all our hits and party with us. Big love, UB40 Ali and Astro”. Michael Bolton is confirmed as the final headliner for Rewind 2019, hitting the stage at Rewind South on Sunday 18 August. The multiple Grammy Award-winning singer and songwriter has sold more than 75 million records worldwide, powered by his unforgettable hits including ‘How Am I Supposed to Live Without You’ and ‘When A Man Loves A Woman’. Rounding out the summer of Rewind are Sister Sledge, Belinda Carlisle, Paul Young, Midge Ure, Hazel O’Connor, The Wailers, The Selecter, Neville Staple, and From The Jam. Trailblazing hip hop DJ Grandmaster Flash will be headlining the Forever Stage on Friday 16 August to kickstart the weekend of fun.